Transportation officials and carmakers for the past 50 years have been steadily improving the “crashworthiness” of vehicles. They’ve mandated seat belts, added air bags and electronic stability control. If you get in an accident today, chances are you — and even your car — will emerge in much better shape than you would have a half-century ago. “We’ve had all these great improvements to the vehicle structure and mechanisms, and we’ve taken that about as far as it can go — our cars are excellent, very safe,” said John Augustine, managing director of the Intelligent Transportation Systems Joint Program Office inside the Department of Transportation’s Research and Innovative Technology Administration. Now, he and many DOT researchers believe we’re about to enter a new phase in transportation safety. If the last 50 years were about mitigating crashes, in the next 50, technology could enable us to actually avoid them — and revolutionize in the process how we get around using all types of transportation. Despite all the seat belts and air bags, more than 30,000 people died in road accidents in the U.S. in 2009. A report released in October by the National Highway Traffic Safety Administration predicted that this new technology — where, in DOT’s vision, millions of vehicles on the road “talk to each other” through a kind of advanced Wi-Fi — could potentially address 81 percent of the light-vehicle crashes currently involving unimpaired drivers. “This may be the one thing we all do in our careers that really makes a difference in society,” Robert Bertini, RITA’s deputy administrator, predicted to a ballroom full of “intelligent transportation” professionals at this week’s annual Transportation Research Board conference in Washington. The new technology would rely on Dedicated Short-Range Communications, a wireless connection with a 1-mile radius that is both faster and more secure than traditional Wi-Fi. Vehicles with the technology could communicate with each other in real time about everything from upcoming icy roads to approaching vehicles in a driver’s blind spot. Emergency responders could be notified the moment an airbag deploys. 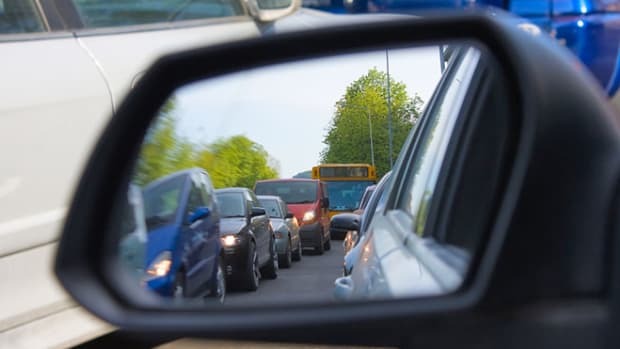 Instead of waiting to learn about a distant accident through the chain-reaction of brake lights illuminated in front of you, your car could automatically warn you the moment a nearby crash occurs (the system would not, however, push the brakes for you). Once vehicles are communicating with each other and with infrastructure like stop lights, road signs and work zones, the technology has implications beyond safety. Officials could manage traffic flow more efficiently. Transit riders could track bus arrivals in real time. Drivers could plot routes with the smallest carbon footprint given traffic conditions. Your cruise control might learn to work in sync with the other cars on a crowded highway. Or, consider this: If you’re approaching a lonely, late-night intersection with a traffic light poised to turn red, it might sense your arrival and hold the green for you. Augustine’s office will spend the next two years researching the technology as the National Highway Traffic Safety Administration prepares to decide in 2013 if the federal government should regulate the technology and mandate it in future vehicles. Researchers don’t yet know, for example, how drivers will react to the system. Should they be alerted of approaching dangers by an audio warning or a seat vibration? Could the data be repackaged by third parties into handheld mobility and environmental applications while ensuring those tools don’t contribute to one of the main problems officials are trying to solve — distracted driving? The DOT is largely focused on the technology’s safety implications, but officials want to make the anonymous data that’s routed through the system available to other researchers in an open-source platform that would allow anyone to come up with application ideas Augustine and his colleagues haven’t even thought of yet. In an atmosphere where public acceptance is as crucial as engineering solutions, Augustine stresses that the system isn’t designed to track you or to help law enforcement dole out speeding tickets. “We know that privacy is a major concern, so we’ve factored that into the technical solution,” he said. It’s clear that car companies and innovative businesses could spin new products from the data — and many are already working on the concept, but Augustine adds that government needs to help get the technology off the ground.